The processing configuration administration page of the dashboard allows users to configure the job decision points presented by Archivematica during transfer and ingest. This screen provides you with an easy form to configure the default processingMCP.xml that governs these decisions. When you change the options using the web interface the necessary XML will be written behind the scenes. Starting in 1.7, Archivematica includes both a default and an automated processing configuration. The automated processing configuration is used only if a transfer source location has been set up to move content through Archivematica with no human operator. Multiple processing configurations can be created using the Add button on the Processing Configuration screen. Often, users create multiple configurations for different types of content - one for audio-visual material, one for images, one for textual records, etc. To edit an existing processing configuration file, click on the Edit button to the right of the processing configuration name. You can download a specific processingMCP.xml via the command line and include it with a transfer. 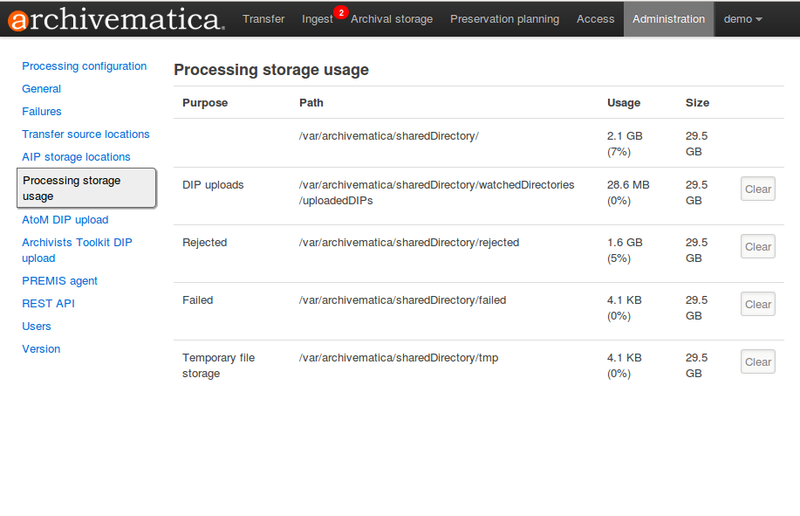 Archivematica will then use this to automate your transfer selections, rather than the default configuration. For more information on the processingMCP.xml file, see Creating a custom config with processingMCP.xml. No - transfers are not sent to quarantine. Data entry field: Enter the number of days that transfers should remain in quarantine (i.e. 5). No - structure report is not created. Yes - the contents of the package are extracted. Yes - the package is deleted. No - Bulk Extractor does not run. Use existing data - reuse file identification data from the transfer tab. None - the user has a chance to review and approve normalization. Archivematica allows users to see add metadata to the SIP using the GUI. This reminder occurs at the last moment that it is possible to add metadata; once the ingest proceeds past this point, it is no longer possible to add metadata to the SIP. Continue - skip the reminder and automatically continue processing. No - Tesseract does not run. 7z using bzip2 - a 7Zip file is created using the tool bzip2. 5 - normal compression mode - the compression tool will strike a balance between speed and compression to make a moderately-sized, moderately-compressed AIP. You can select which checksum algorithm Archivematica will use during the Assign UUIDs and checksums micro-service in Transfer. Choose between MD5, SHA-1, SHA-256 and SHA-512. Archivematica has access integrations with three access platforms: AtoM, ArchivesSpace, and Archivists’ Toolkit. Archivematica can upload DIPs directly to an AtoM website so that the contents can be accessed online. 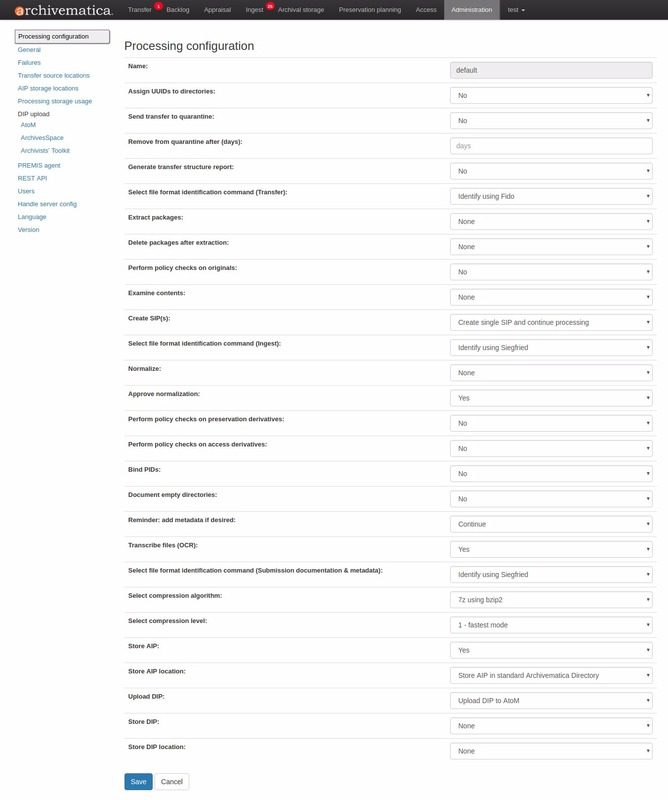 The AtoM DIP upload configuration page is where you specify the AtoM installation where you’d like to upload DIPs (and, if you are using Rsync to transfer the DIP files, the Rsync transfer details). For more information on configuring the AtoM DIP upload parameters and the servers, please see the Admin Manual AtoM DIP upload configuration instructions. 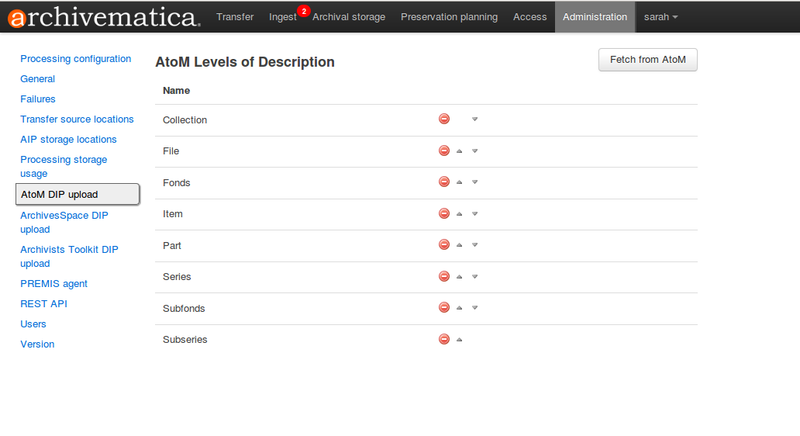 The Archivematica dashboard is in the process of being translated. For more information, see Translations.